Play a vital role in keeing the Warwick Public Library your “Open Door to Learning” by making a donation to the Endowment Fund, a Tribute donation, or a donation to the Friends of the Library. The Library Endowment welcomes gifts from individuals, corporations, foundations, and estates for general support of Library services and for specific programs and projects. Direct donations and charitable bequests are greatly appreciated. We recommend that you talk with your attorney or financial advisor about the best ways to benefit the Library with your generosity. The Endowment funds are managed by the Rhode Island Foundation. Tribute donations are a meaningful way to honor or thank a special person, remember a loved one, or commemorate a special event such as a birth or anniversary. For donations of $25 or more, a gift plate will be placed in a selected book and an acknowledgement sent from the library. 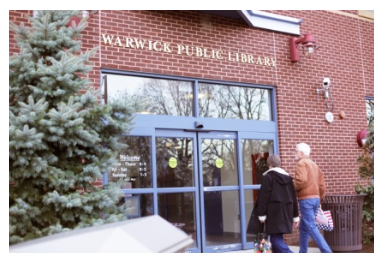 For more than 50 years, the Friends of the Warwick Public Library has been a member-supported, nonprofit organization that assists the library in its work as an important educational, cultural, and recreation center in our community. The Friends sponsor concerts, storytimes, movies, museum passes, and summer reading and help with purchases and projects. The Friends raise funds through two, bi-annual book sales and through individual, family, and patron memberships, and we encourage you to join us as a member to help keep our library active and strong.